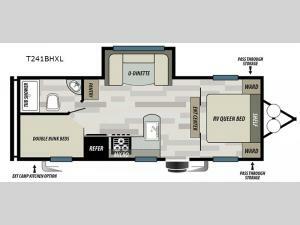 This Salem Cruise Lite travel trailer is great for a larger family! With double bunk beds, and a slide out in the living area, you can see how this unit can serve your family well. There is a three burner range and a microwave to prepare all your meals and a full rear corner bath allows you to clean up after being outside all day. There is even the exterior kitchen option if you choose to add it. This unit includes a private front bedroom with an RV queen bed and wardrobes for clothes and a front pass through storage for all the hiking gear!